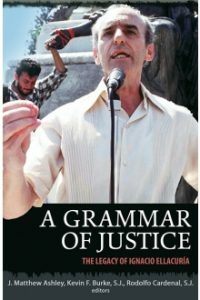 J. Matthew Ashley, Kevin Burke, SJ, and Rodolfo Cardenal, SJ, have collaborated to edit A Grammar of Justice: The Legacy of Ignacio Ellacuría. The book, published through Orbis, is available on the 25th anniversary of the murder of Ellacuría and other Jesuits at the University of Central America in San Salvador. The editors include two works by Ellacuría (including his essay, “Utopia and Propheticism from Latin America”) and several scholarly contributions. Update: The Journal of Jesuit Studies has reviewed A Grammar of Justice (Volume 3, Issue 4).